The rumor mill is swirling. 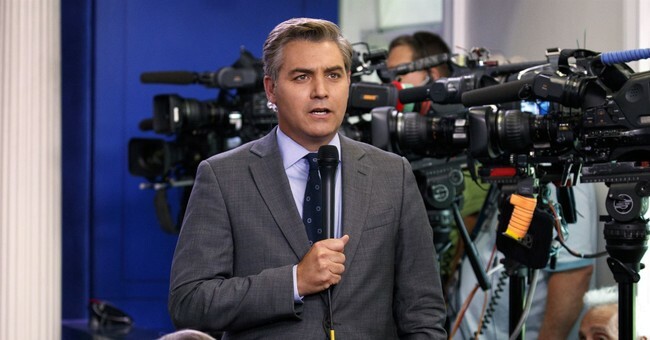 Reports are coming in that CNN and their Chief White House Correspondent, Jim Acosta, are preparing to sue the Trump administration over the revocation of Acosta's permanent press credentials, commonly referred to as a "hard pass." Former ABC News reporter and anchor Sam Donaldson appeared Sunday on CNN's "Reliable Sources" with Brian Stetler and said he believed a lawsuit had already been filed, The Washington Examiner reported. According to a CNN spokesperson, the lawsuit hasn't been filed. "No decisions have been made. We have reached out to the White House and gotten no response," the spokesperson told The Examiner. Donaldson allegedly knew about the lawsuit because the news network asked him to provide an affidavit on their behalf. According to Floyd Abrams, a constitutional law expert who appeared on Stetler's show, CNN should sue the Trump administration over the issue. "I think it's a really strong lawsuit. I can understand CNN being reluctant to sue because the president keeps saying CNN is the enemy of me, and CNN might have reluctance to have a lawsuit titled 'CNN vs. Donald Trump.' That said, yes, I think they should sue," Abrams said. "This is going to happen again. It's likely to happen again. So whether it's CNN suing or the next company suing, someone is going to have to bring a lawsuit. And whoever does is going to win unless there's some sort of reason." The alleged lawsuit is the latest in a string of incidents involving CNN's Jim Acosta. On Wednesday, the White House pulled his permanent press pass after determining that he was inappropriate during a press conference earlier in the day. Press Secretary Sarah Huckabee Sanders said the Trump administration won't stand for "a reporter placing his hands on a young woman just trying to do her job as a White House intern." Various journalism organizations stood with Acosta. Huckabee Sanders reiterated that the White House stands by their decision to revoke Acosta's access.